Businesses of today need to navigate change rapidly. Whether it is the global market and the demands it places, or the disruptions which present themselves suddenly, leadership is more demanding than it ever was. Which is why today’s business leaders, as most experts will tell you, need to be flexible, nimble, innovative and ready to adapt to fast-changing conditions. The next generation, which is preparing to take over the reins at their family-owned businesses or even setting up ventures of their own, therefore have their task cut out. It’s a whole new world out there, and sitting in the corner room will hardly be easy. For this year’s GenNext special issue, we pick those business leaders who are showing the way in taking their businesses forward, adding their unique stamp to them by way of innovation and sheer entrepreneurial energy. 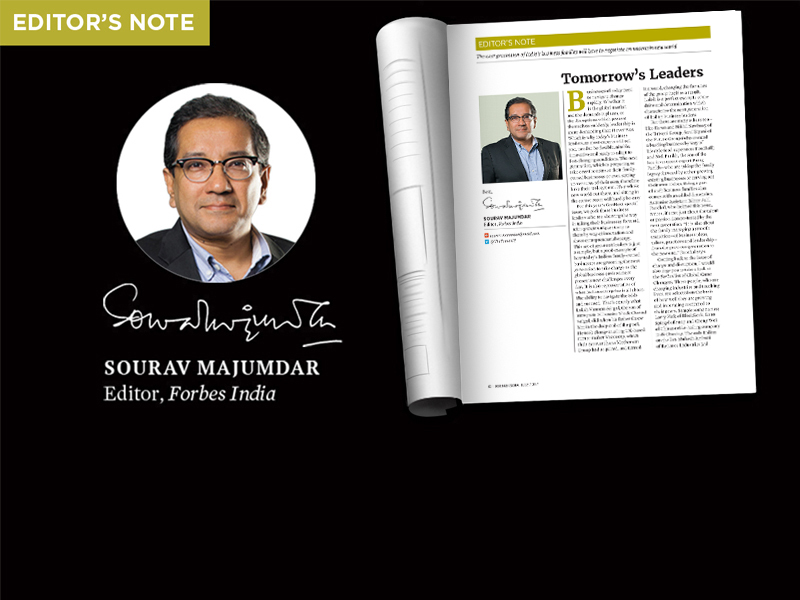 This set of gen-next leaders is just a sample, but a good example of how today’s Indian family-owned businesses are grooming the next generation to take charge as the global business environment presents new challenges every day. It is also representative of what Indian enterprise is all about: The ability to navigate the odds and succeed. That’s exactly what Laksh Vaaman Sehgal, the son of auto parts billionaire Vivek Chaand Sehgal, did when his father threw him in the deep end of the pool. He took charge at ailing UK-based mirror maker Visiocorp, which their Samvardhana Motherson Group had acquired, and turned it around, changing the fortunes of the group itself as a result. 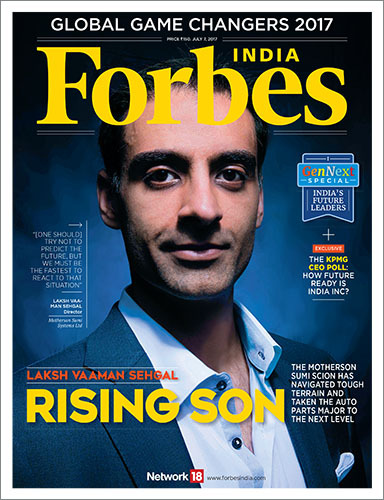 Laksh is a perfect example of the drive and determination which characterise the next generation of Indian business leaders. But there are many others too—like Tarun and Nikhil Sawhney of the Triveni Group, Avni Biyani of the Future Group (who created a bustling business by way of lifestyle food superstore Foodhall) and Neil Parikh, the son of the late investment expert Parag Parikh—who are taking the family legacy forward by either growing existing businesses or carving out their own niches. Being a part of such business families also comes with an added dimension. As Senior Assistant Editor Salil Panchal, who helmed this issue, writes, it’s not just about the talent or passion demonstrated by the next generation. “It is also about the family managing a smooth transition—of business ideas, values, practices and leadership—from the previous generation to the new one,” Panchal says. Coming back to the issue of change and disruption, I would also urge you to take a look at the Forbes list of Global Game Changers. These people, who are changing industries and touching lives, are selected on the basis of how well they are growing and innovating compared to their peers. Sample some names: Larry Fink of BlackRock, Evan Spiegel of Snap and Cheng Wei of Chinese ride-hailing company Didi Chuxing. The only Indian on the list: Mukesh Ambani of Reliance Industries Ltd.